We aimed to report the clinical manifestations and immunological features of activated phosphatidylinositol 3-kinase δ syndrome 1 (APDS1) in a Chinese cohort. Moreover, we investigated the efficacy and safety of rapamycin therapy for Chinese patients with APDS1. Fifteen Chinese patients with APDS1 from 14 unrelated families were enrolled in this study. These patients were diagnosed based on clinical features, immunological phenotype, and whole-exome sequencing. Four patients were treated with rapamycin, and the clinical efficacy and safety of rapamycin were observed. The changes of phosphorylation of Akt and mammalian target of rapamycin (mTOR) signaling pathway after rapamycin treatment were detected by flow cytometry and real-time PCR. The common clinical manifestations of the patients included lymphadenopathy (93%), recurrent sinopulmonary infections (93%), hepatosplenomegaly (93%), and diarrhea (78%). Epstein-Barr virus (EBV) (80%) and fungus (Aspergillus) (47%) were the most common pathogens. 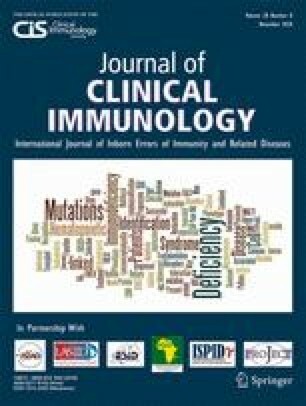 Immunological phenotype included elevated Immunoglobulin (Ig) M levels (100%), decreased naive T cells, increased senescent T cells, and expanded transitional B cells. Whole-exome sequencing indicated that 13 patients had heterogeneous PIK3CD E1021K mutations, 1 patient had heterogeneous E1025G mutation and 1 patient had heterogeneous Y524N mutation. Gain-of-function (GOF) PIK3CD mutations increased the phosphorylation of the Akt-mTOR signaling pathway. Four patients underwent rapamycin therapy, experiencing substantial improvement in clinical symptoms and immunological phenotype. Rapamycin inhibited the activated Akt-mTOR signaling pathway. We described 15 Chinese patients with APDS1. Treatment with the mTOR inhibitor rapamycin improved patient outcomes. Ying Wang, Wenjie Wang and Luyao Liu contributed equally to this work. The online version of this article ( https://doi.org/10.1007/s10875-018-0568-x) contains supplementary material, which is available to authorized users. Many thanks to the patients and their parents. This study was supported by the National Natural Science Foundation of China (81471482), Science and Technology Commission of Shanghai Municipality (14411965400), and Shanghai Hospital Development Center (SHDC12016228).